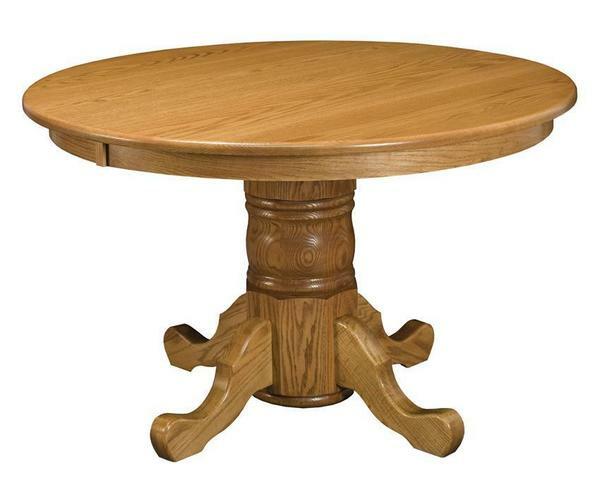 The one photo of our Amish Custom Single Pedestal Table is shown in hard maple wood with a natural finish. The top is a 42" round with a roundover edge and princess feet. The other photo is our single pedestal table shown in oak wood with a 48" round top, roundover edge and our standard princess feet. Please call one of our Amish furniture specialists with questions or ordering assistance. They are happy to assist you with finding matching Amish chairs, selecting your wood and finish or taking your order over the phone. We also have a custom double pedestal dining room table if you need something larger. 1-2 Leaves Available on 36"
1-3 Leaves Available on 42"
1-4 Leaves Available on 48" & 54"
We are very pleased with our purchase and doubly pleased with YOUR CHOICE of delivery personnel. Kevin Lutes was everything and more than was expected and certainly reflects on your company. Thank you Kevin Lutes for your careful handling of our new furniture- delivery,set-up, and clean-up. !! !